Hey there every peoples. 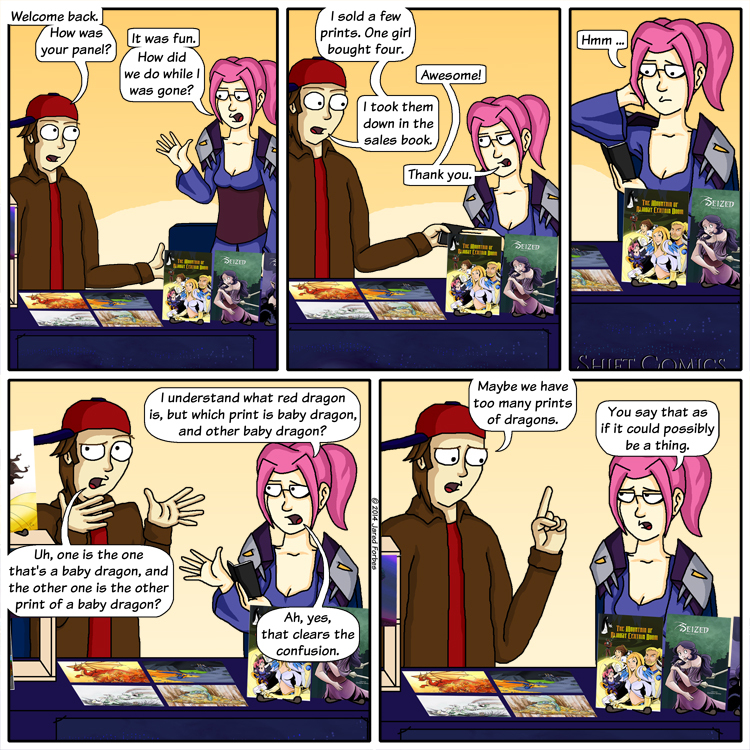 Today's comic is also another comic from our experiences at ConBust. Again this comic pretty much went down almost the same way in reality as it did in the comic. During one of the times Christina was away from the booth I sold a lot of prints. Durning the convention we kept a sales book, where we'd make notes of everything that was sold, both for inventory purposes, and to gauge which pieces were popular, but I digress. For the most part Christina was the one that took these notes, jotting down the name of each item that sould, quantity and dollar amount. Thing is she had a proper name for all of her prints, whilst I kind of just made things up as it went. Thus Baby Dragon, and Other Baby Dragon. We have lots of dragons.